Advertisement for Atabrine, an anti-malaria drug, 1941. This sign was posted at the 363rd Station Hospital during World War II, in Papua, New Guinea. It effectively (if morbidly) promoted the use of Atabrine, an anti-malaria drug. Also it’s an example of persuasive advertising where the skulls and the language are used to cause fear and to motivate. Atabrine was the tradename for Mepacrine (also called quinacrine). Mepacrine was initially approved in the 1930s as an antimalarial drug. It was used extensively during the second World War by US marines fighting in the Far East to prevent malaria. Of all the enemies American soldiers confronted during World War II, malaria proved to be among the most stubborn. The mosquito-borne disease was a constant scourge for GIs stationed in the Pacific and Mediterranean theaters. General MacArthur’s retreat to the malarial Philippine peninsula of Bataan in early 1942 led directly to his sickly army’s surrender to the Japanese a few months later. The illness continued to cripple American forces during the ensuing campaigns in Papua New Guinea and Guadalcanal, where it was so rampant that a division commander ordered that no Marine be excused from duty without a temperature of at least 103°F (40°C). One estimate, which was probably conservative, judged the number of cases of malaria in Filipino-American Forces at the time of surrender, on 9 April 1942, to be 24,000. After some fits and starts, the military responded to the malaria outbreak with a full-out assault. The Army’s Medical Department dispatched malaria control units to war zones to clear and clean standing water and bombard malarial areas with recently developed insecticides like DDT and “bug bombs”. 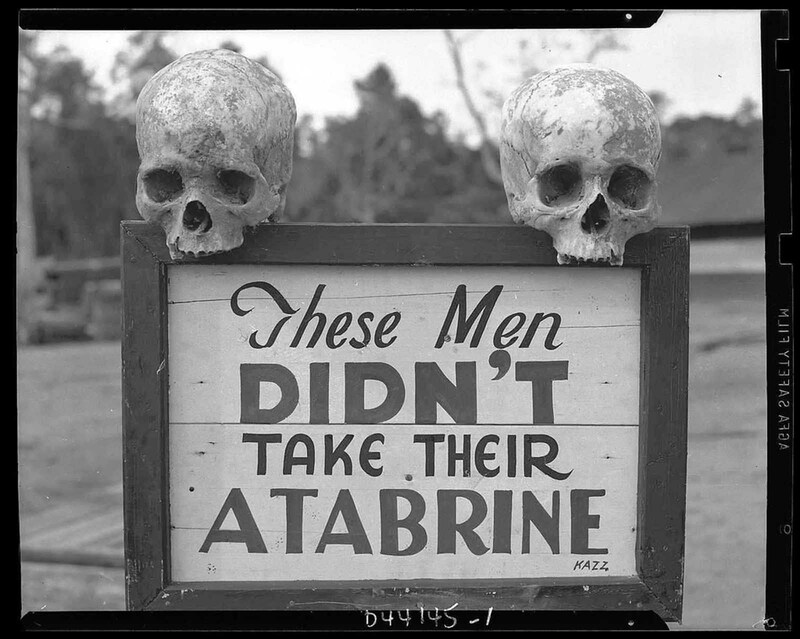 With access to quinine cut off by the Japanese conquest of Java, the government sped up trials of the anti-malarial medicine Atabrine. Despite side effects such as turning the skin yellow, millions of tablets of the drug were distributed to troops toward the end of the war. The treatment of malaria in vogue in 1941 consisted of 2 grams of quinine sulfate daily by month for 5 days followed by .030 gm. of Plasmochin naphthoate (pamaquine naphthoate) daily in three divided doses for 5 to 7 days. Atabrine was an acceptable substitute for quinine. The long quinine treatment calling for .650 gm. of quinine daily for 8 weeks, after the initial 5-day treatment of the acute phase, was considered effective but difficult to supervise. The short quinine treatment consisting of 1 gm. to 1.3 gm, of quinine daily for 4 to 7 days, repeating for relapses, was considered to be acceptable in that it avoided the disadvantages of prolonged quinine therapy and was fairly successful. As Plasmochin and Atabrine were available only in limited amounts, a short quinine treatment was most commonly prescribed. (Photo credit: National Museum of Health and Medicine). Great picture! Atabrine was also issued to soldiers in the European Theater. My Dad wrote of taking Atabrine in Sicily in August of '43 and Italy in April of '44, They would take it in the spring and summer and taper off in the fall and not take it in the winter. He wrote his wife in December of '43, "All during the malaria season we took atabrine, one tablet a day and this was enough to keep the malaria parasite down and the patient clinically free of symptoms. But more important, don’t get bitten by the mosquito, use the mosquito nets, gloves, head nets etc." Malaria is not unique to the Pacific.